This is the humble beginning of ToadRockStreet, originally on Blogspot. It's probably still there; I'm not quite sure what to do with it to be honest. I really like some of the photography in my early days and will do something with it one day. It's a bit of a mess at the moment but that's the reality of how it was at the beginning. January in my small world crunches underfoot. 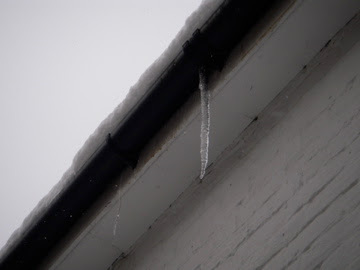 Knife-like icicles hang from the gables. I think of January as always being covered under a muffling blanket of snow. I'm starting a knitted quilt based on January colours (snowdrops and crocus), mainly using the Aran wool my mother brought back from a trip to Ireland when I was 16. I've been too sentimental to create anything with it, but it has to have its day and the time seems right. 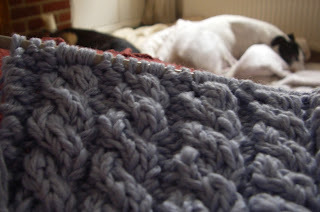 There's no particular plan, just small white and lavender-blue squares probably using traditional Aran patterns. Not sure about the overall look as yet, very much a 'see what happens' design. This Aran wool is anything but delicate. It has some earthy rough fibres in it, including the occasional strand of what looks like wood!! It knits beautifully though; nice and sturdy but quite soft-looking. As there's been no snow this January I've been looking out for other hints of natural whites. On a short walk with Tara & Charlie last week (very cold and frosty day with a vivid blue sky), I noticed these beautiful waxy white flowers in a hedgerow just a short distance away. February is a bit of a dark month, not in a depressing way though. In my memory its colours are almost monochromatic, certainly muted. February is wrapped up in Dylan Thomas' 'Winter sticks' and ravens' coughs. It's a practical month; a buffer between the end of winter and the start of spring. The snow in early February was a surprise. It fell very quickly and conveniently on a Saturday night so that the only place we could get to was the local pub and Toad Rock itself. Walking Tara & Charlie on February 5th, we passed this old-fashioned snowman in Denny Bottom. It has all of the traditional elements a good snowman should have: carrot nose, top hat, coal buttons, twiggy arms. But only in Royal Tunbridge Wells could it have Jersey Royals for eyes. I love the shape of our dogs' paws and the imprints they leave, also the patterns occasionally found beneath them. Inside ToadRockStreet, life is warmer and more colourful. Carrying on the theme of Winter sticks and ravens' coughs we spent the third week of Feb in an isolated cottage in Scotland, close to Glenluce Abbey. What were we thinking? The only drinking water was via a spring and we were right on the edge of a forest with pot holes in the road so big they could hold a Belted Galloway or two. We coughed and spluttered our way through the week with heavy colds and avoided the wind which knocked Charlie Boing over on two occasions. We saw more ravens and hooded crows than I've ever seen before; they were our constant companions throughout our people-less week. The view from one side of the cottage; lovely russet browns that were far richer and more intense in real life. The copse on the hill, home of the hooded crows that flew back-and-to all day. More Winter sticks, although closer to Winter twigs. These beautiul wispy grasses were at least 4ft in height and bordered the most unusual bay in Wigtown. Stairhaven in the Machars. A dark sandy/pebbly beach overlooking the Isle of Man. The cold could have sliced us in two at this point but the Bogleys loved the sand and Charlie Boing was almost insistent that we let him go into the water (which didn't happen). You can sail around this part of the coastline but only a short way out and you're in MOD territory. What they want with the place I don't know. If only I had brought some black wool with me to Scotland I could have made so many things inspired by the lines lying idle on the quayside at PortPatrick. I searched and searched for wool shops in Galloway, hoping for lovely warm rows of colours and textures at my fingertips, but it wasn't to be. The only place to be after the coast was in the warmth of the cottage: a good fire on the go, Musician Husband cooking something fabulous for supper, the Bogleys cushioned together, the black and white grid of a new crossword, a glass of wine and the rich red and gold of new wool with a vague pattern in mind. Several bags of knitting to look through. Bread dough made and proving on the dining room table. Big red sofa to relax on whilst the dogs sleep. First Charlie and I have to go through the wool game. 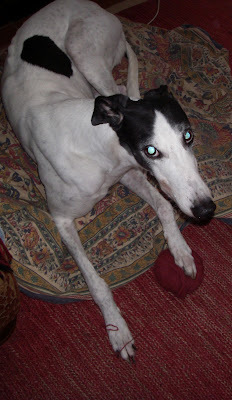 I spend time carefully choosing wool from the stash upstairs. I consider shades, fibre qualities and weight. I bring it downstairs and leave it on the arm of the sofa, ready to get started. I go to make a cup of tea. Charlie steals the wool when I'm out of the room and plays with it on the sitting-room floor. He doesn't damage it, just throws it around a bit. He then puts a paw on one ball and drifts off to sleep. So, first, a nice cup of tea! Then I drag every bag of nearly-completed knitting out into the light. I want to see them all so that I can choose which one I'm going to complete next. In truth, I just want to look at them again. How I love this gorgeous, soft warm cotton scarf I'm making for the Musician Husband. It's taken two years so far because I keep putting it down and starting something else. Now to check what I made in Galloway. The red and gold purse-type-thing is completed with a pretty flower from the crochet book (I couldn't help trying something out before I had time to sit down and read through it fully). The blue-yellow bag is in need of inspiration from the book (which later comes in the form of small stars). Another square for the lavender-blue/white-Aran quilt. The Bogleys sleep on in the background. And, for something completely different. I promised a quilt for a friend who was due to have her second child. He's now about 6 months old...I will get it done, I promise! And finally, lovely crusty French bread for lunch. A truly, lovely cosy day at ToadRockStreet.